Animals that live in groups interact with each other in different ways leading to a variety of social relationships. In this presentation I will talk about how animals that live in groups make “friends”, how they find a mate to breed and the relationships with their offspring. 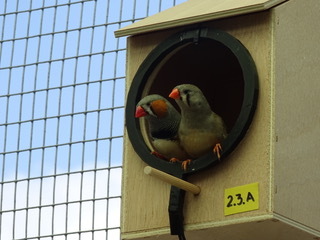 I will introduce the Zebra Finches, a great system to learn about the social behaviour of birds because they live in large groups and form pairs for life. To study these birds, and to understand their behaviour, I first developed an automated system with the help of students at the University of Konstanz. With this system, it is possible to observe the birds feeding, perching, preening, feeding their chicks and sometimes fighting. The birds carry backpacks with barcodes that a computer can read. This way, it is possible to learn about the adaptations individuals have for living in large groups.